The Mediterranean diet is the expression of healthy eating and protecting our body from chronic diseases, while fulfilling at the same time our daily needs in essential nutrients such as proteins, carbohydrates and fats. Moreover it offers a lot of minerals and vitamins. Legumes are a key component of the Mediterranean diet. The Mediterranean diet is based on the traditional way of eating followed by the Cretans, around 1960s, which leaded in very low rates of chronic diseases (heart disease, diabetes, cancer) and longevity. It is an expression of healthy eating because it meets all the specifications of a healthy diet. In fact it comes to supplement it, highlighting the great value of olive oil and its use, not only in raw and boiled salads, but in cooking as well. The characteristics of the Mediterranean diet. Frequent consumption of fruit and vegetables. Very seldom consumption of red meat (2 or 3 times a month). Consumption of olive oil, as the main added oil. Low consumption of saturated fats (animal fats). Daily consumption of red wine, in small amounts (1-2 portions/day). The Mediterranean diet is presented as a pyramid schematically. At its base are the foods that should be consumed in greater quantities and more frequently (whole wheat bread, pasta, rice, oatmeal, potatoes and other grains). Right above are the foods that should be consumed daily in smaller quantities (fruit and vegetables, legumes and nuts). Moving on, we see that meat occupies less space in the pyramid, which means that it shouldn’t be consumed very often. Legumes are included in the foods that should be consumed daily, or several days a week, and are therefore an integral part of the Mediterranean diet. The structural units of proteins are amino acids. Today we know 21 different amino acids, which are divided in essential and non-essential amino acids. Our body cannot synthesize the essential amino acids and, so it has to take them from food. The non-essential amino acids can be synthesized by our body. The biological value of dietary proteins is defined by the presence of essential amino acids. Proteins that contain essential amino acids in quantities that are sufficient for the human body are called high biological value proteins. Such proteins can be found in animal foods i.e. meat, fish, eggs, cheese, etc. Proteins that lack one or more essential amino acids are called low biological value proteins and can be found in plant foods, such as grains, nuts, legumes and vegetables. However, the right combinations of plant proteins can produce high biological value proteins, equal to the ones found in animal foods. The ability of proteins to complement one another is known as complementary value of proteins. Such combinations are: grains with legumes (such as lentils and rice, rice and peas, beans and bread), vegetables with legumes, beans with potatoes, tahini and bread, etc. With the term legumes, we describe the ripe and dried fruit of certain plants of the legume family. Legumes can be the main meal in our diet, combined with various vegetables and cereals. Lentils and chickpeas were known in all Mediterranean countries from biblical times. Flat beans and peas were known in Ancient Greece. White beans were cultivated much later in the Mediterranean and their country of origin is considered to be America. The legumes mostly consumed in the Mediterranean are beans, lentils, chickpeas, peas, flat beans and split peas. Beans, lentils and split peas can be found in different colors. The chemical composition of legumes varies, but they are generally considered to be rich in plant proteins, which, like animal proteins, help in the formation and regeneration of body cells. 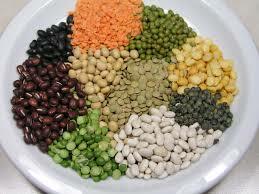 Legumes are also considered to be a good source of carbohydrates (starch). They also contain vitamins as well as calcium, iron, potassium, sodium and phosphorous. Finally, legumes are an excellent source of fiber (cellulose), as opposed to animal foods (meat, fish, eggs, milk, cheese), which completely lack fiber. A portion of cooked legumes is approximately 150gr. (equivalent to 70gr. of uncooked product, or a cup of cooked legumes), amount which causes satiety, due to the high fiber content. Legumes were for many centuries the main source of protein for economically disadvantaged people, who were not able to purchase and consume foods of animal origin. There was, therefore, the misconception that legumes are poor people food, and thus inferior food. Modern trends, though, of healthy eating contradict these perceptions and suggest we should return to a more traditional way of eating and adhere to the Mediterranean diet, which suggests to consume legumes 3-4 times a week. The ways of cooking of legumes are limited and pretty much resemble each other. What gives them a different taste is the addition of aromatic herbs, which are combined really well with legumes. With the various types of legumes one can cook delicious soups, purees, stews, casseroles, a variety of salads, etc. Legumes should be cleaned from impurities in them, such as stones or other grains. It is necessary to sod them in water before cooking, for about 12 hours. Sodding softens their skin and makes them more digestible. Lentils are a type of legumes that do not need necessarily sodding. Also, sodding can be avoided if we use a pressure cooker. We shouldn’t use baking soda while sodding legumes, because it destroys their nutrients and mostly their vitamins. Adding aromatic herbs such as celery, onion, laurel, fennel, garlic or thyme, during boiling is a proper procedure, because they stimulate the secretion of gastric fluids, which helps with the digestion of the legumes. The addition of salt should be done at the end of the boiling, to prevent the toughness of the skin. Legumes should be cooked well before consumed and the water should be changed a couple of times, in order to make them more digestible. Many types of legumes can be cooked as a whole or split. Also, they can be cooked with their skin or without it, depending on the recipe. Such legumes are chickpeas, flat beans, lentils, etc. Roula Gouroudi is a clinical dietitian from Greece. She has a blog in Greek, which you can check out, of course. You'll find it at the address diatrofikessymvoules.wordpress.com.